In Chapel Hill, North Carolina we had 93.3% coverage. That's not totality, but it was awesome nonetheless. I started observing at 1:30. It was about 91 degrees, not a cloud in the sky. Standing under direct sunlight, one would sweat within minutes. Around 2 things started to get interesting. The first thing I noticed were the sharply-defined shadows. The sky was not as bright, either. You didn't have to squint when looking up! By 2:15 the temperature started to drop. And then something occurred which I hadn't expected--had never read about--a cool breeze started up. I didn't know if this was due to the eclipse or not, but it was noticeable and lasted throughout the event. (I have a friend who journeyed down to Columbia, SC to witness totality; he said a similar breeze occurred there.) I later learned this phenomenon is real and is termed an eclipse breeze. By 2:30 the temperature had dropped several degrees. The shadows were even more sharply-defined. I'd never seen anything like it. Our black cat came out of hiding in his bush by the side of the driveway and gazed uneasily about. Take a look at the picture below. We have a large pin oak tree in our front yard. 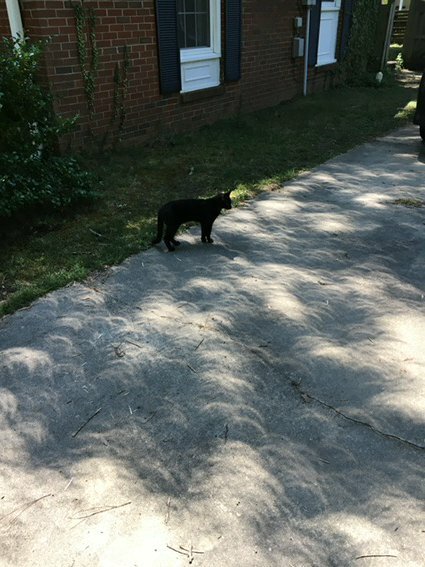 The sunlight passing through the spaces between the leaves acted like pin-hole projectors and cast hundreds of mini-eclipses on the driveway. So cool! Greatest coverage occurred at 2:43. It was amazing. The light-level was a bit brighter than at dusk. Everything had a slightly green-orange tint. The air was cool. This phase lasted about fifteen minutes or so. Then the sky began to brighten. The temperature climbed. Though I wished otherwise, soon it was summertime once again. Another interesting collection of classic science fiction is to be found in the Science Fiction Book Club 50th Anniversary Collection. These came out between 2003 and 2007, about eight volumes per year, each with a full-color newly-commissioned illustration on the front cover and black-and-white photograph of the author on the back cover. There are some real finds here: Under Pressure was Frank Herbert's first novel, published in 1956 and out of print for decades. City, by Clifford Simak is an eerie tale, one of the first to predict the rise of robots and the first to predict the takeover of the human race by talking dogs. It also includes early works by Robert Heinlein and Isaac Asimov. 14. A Canticle for Leibowitz by Walter M. Miller, Jr.
20. Her Smoke Rose Up Forever by James Tiptree, Jr.